I can't believe I missed this for International Talk Like a Pirate Day. Because, "Arr and avast, throw me a rope, matey." Notes: This is a really great pattern. 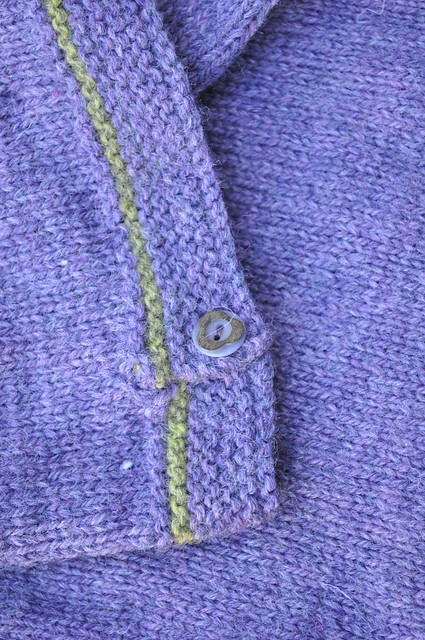 There's lots of plain ribbing for when you don't want to think about your knitting and then a fun cabled section. 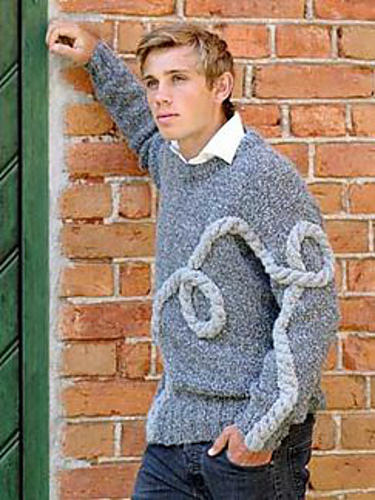 Notes: After seeing this striped version on Ravelry I really wanted to knit this. It's a quick and easy pattern. 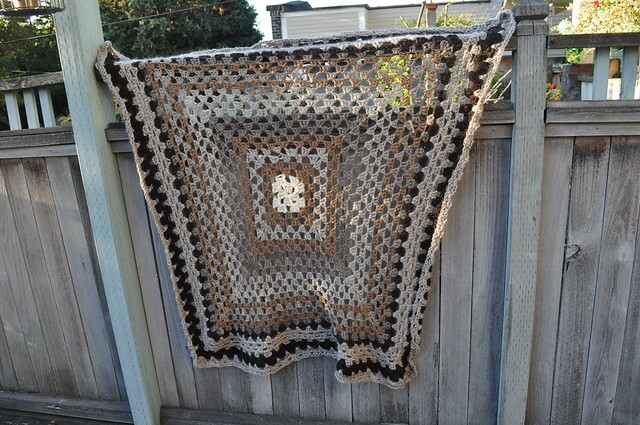 The only difficult part was dealing with all those ends in a cotton blend yarn. He took time out of his evening to create this for me. This pattern is making me feel a little ranty. Let's see. It's a) ugly, b) unflattering, c) it hangs all wonky on the model, d) is straining under its own weight. 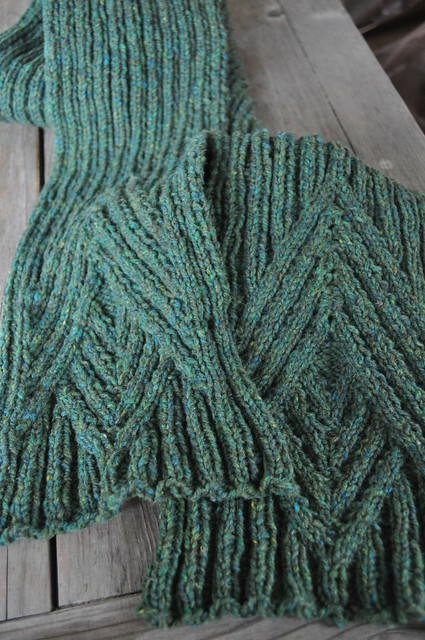 To knit this beauty you take NINE strands of various Li0n Brand yarns and size 50 (FIFTY!) needles and whip this sucker up in a matter of minutes. I wondered, "What's the gauge on this?" and found the pattern reads, "Exact gauge is not essential to this project." What? Then why is there a schematic with measurements on it? In multiple sizes. Oh and it goes up to a 50 inch chest (not that you'll actually get a dress that size because "gauge is not essential.") Can you imagine this enormous hunk of acrylic in a size 2X which is 66" at its widest point? That, by the way, requires 27 skeins of yarn to knit. A FOUR POUND, NINE OUNCE DRESS! Not to mention the seams. They must be so thick with big gaping holes between the stitches. And...I better just let it go. Here, I'll say something nice about it. I like the model's hair and makeup. I have never been a monogamous knitter but over the past few years I've definitely developed a habit of having a main project that gets the bulk of my knitting attention. I don't know if I should blame Sock Summit, fall ennui or solar flares but I have lost all semblance of focus lately. Here is a rundown. The Beekeeper's Quilt. 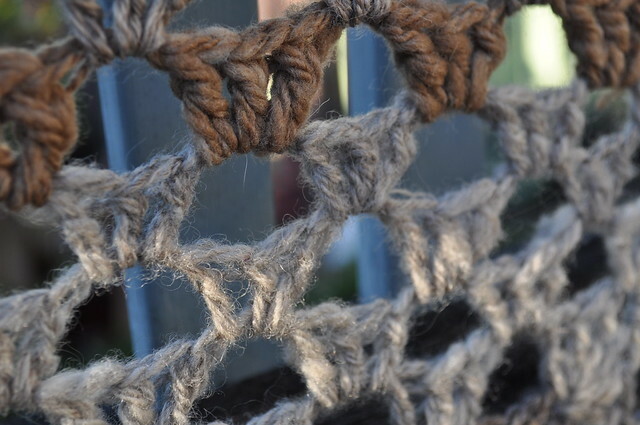 This is a wonderfully diverting project that has now become my carrying around knitting and my low-concentration knitting. I now have (runs off to count) 32 puffs done with hundreds to go. I started Blu in June after purchasing the yarn four and a half years ago. 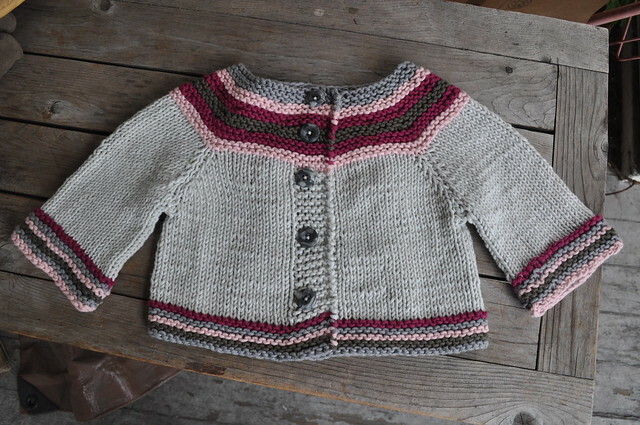 The pieces are knitted and have been washed and shrunk. Now they need a lot of embroidering and seaming and I just can't muster the enthusiasm. Uptown Boot Socks. I started these suckers in February. 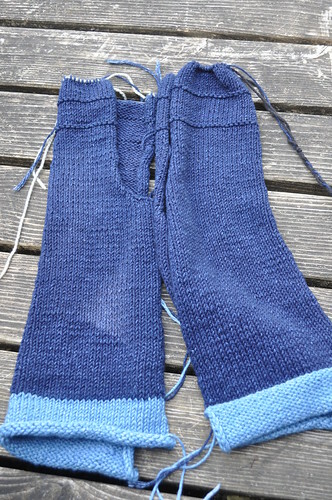 I've knit a tiny bit here and there on them this summer and have only just recently turned the heel on the first sock. Fast Forward. 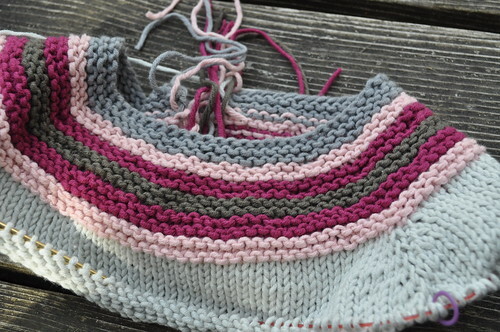 I started this in March and have only a few more inches of ribbing to knit and the second cable section. I think part of the reason I stalled on this is that the Shelter yarn I'm using is so scratchy I don't think I'll ever wear the scart. I started this in Tosh Merino Light on my flight to Chicago. I was having a really hard time. I kept making little mistakes and ripping it out on the plane. I got frustrated and set it aside. I ripped back to the first increases and I have had no problems with it. It's now my tv knitting. 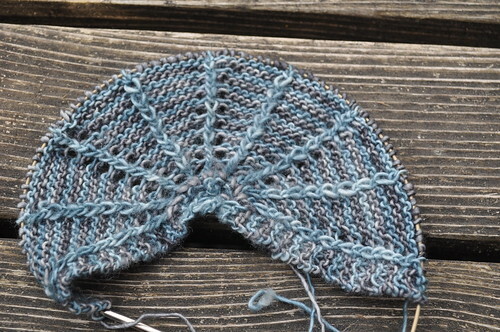 I got as far as winding the yarn (Miss Babs's Yummy Sock) and casting on while avoiding the Cornflower Shawl. I found out last Friday that one of my sons' former after-school teachers just had a baby girl. 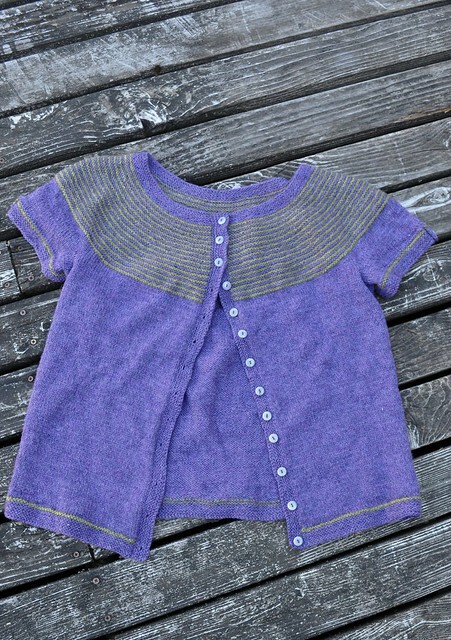 I cast on for this simple sweater in leftover All Seasons Cotton. I thought I could knock it off in a weekend but I just have it sitting by my computer so I haven't put that much time into it. So that's mostly everything. I feel defeated by this pile of knitting. I need to finish a few things and cross them off my list! It's September so naturally everyone is thinking about Christmas. Wait...what? Anyway, the holiday patterns are starting to roll in. 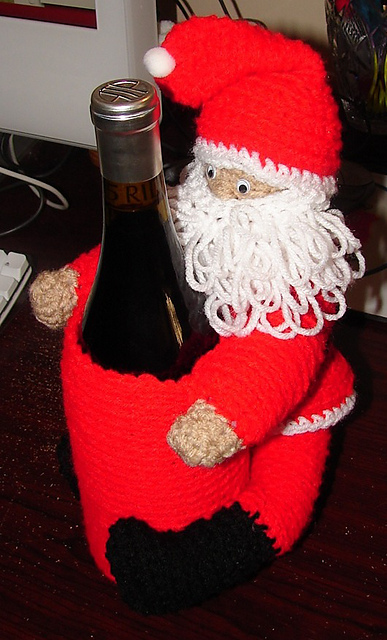 Old Saint Nick has often been described as jolly but I don't think I've ever seen him quite this happy. 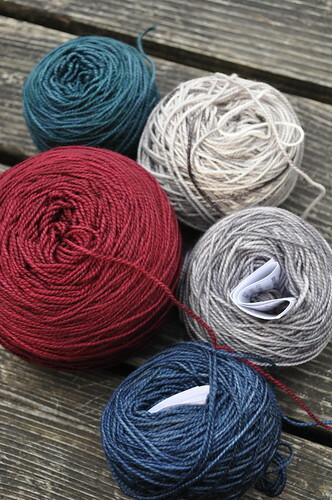 I may not be finding much time to blog but you can catch up with me a bit on the Doubleknit podcast. 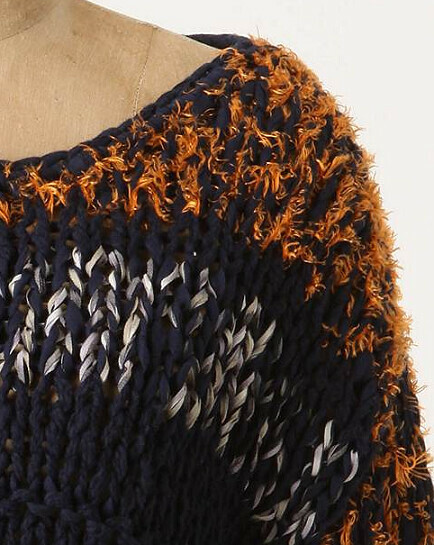 I found this sweater while browsing the online store of a shop I'm sure you'll all recognize. It was so horrible I had to zoom in for a close up. Are the shoulders really covered in orange fur? I realized this deserved further investigation. 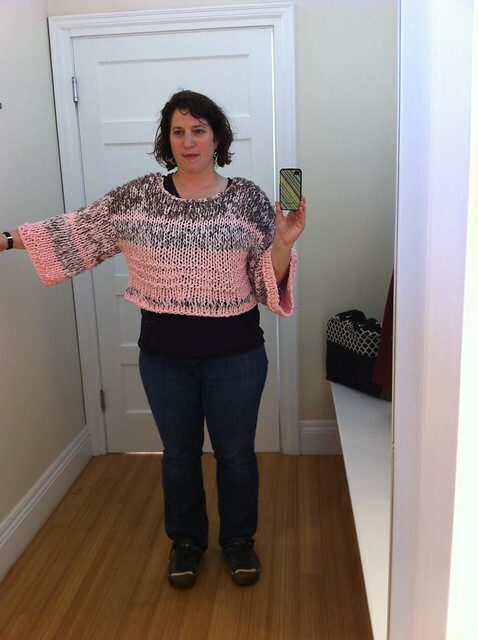 So while on a recent trip to the mall I found the sweater in question in, what I believe, is an even uglier colorway, and tried it on for you, my dear readers. This is the depth of love I feel for you! It's worse than I thought. And so heavy. 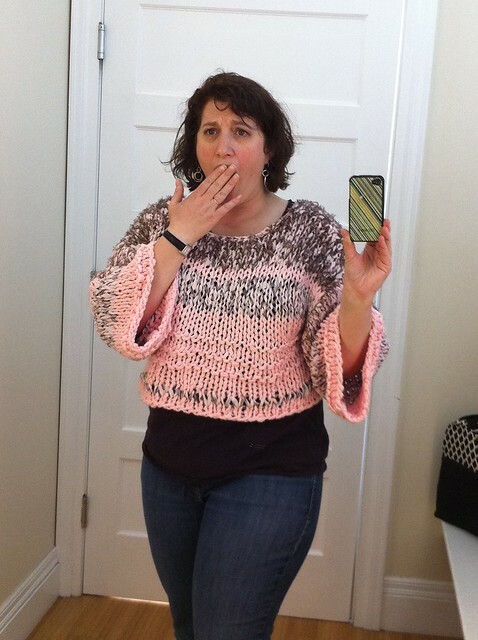 I tried to strike a pose in which I looked horrified by the sweater but instead I look like I'm yawning. As if to say, "Giant pink, furry-shouldered, cropped sweaters are so last week." Notes: This was started on a lark late one night last winter. It goes extremely fast, especially with such a giant hook. I ran out of yarn and had to spin more brown Romney to try to match the uneven spinning I did years ago. Once I washed it I found it was quite a bit thicker than the other samples but I don't care. 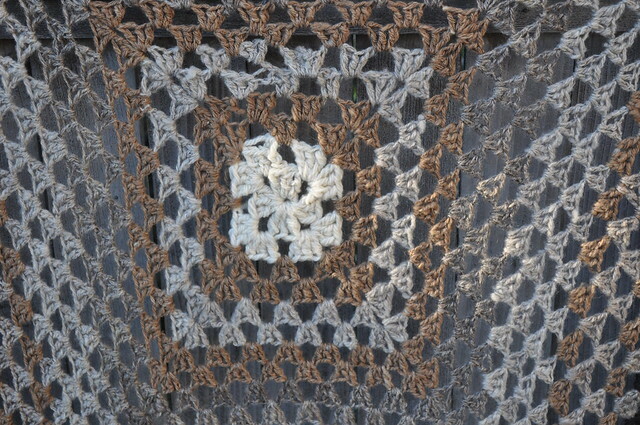 I'm a mediocre crocheter at best so there are a lot of errors in it. But it's very warm and I love all the natural-colored wools. Notes: I have no idea why this took me so long to complete. 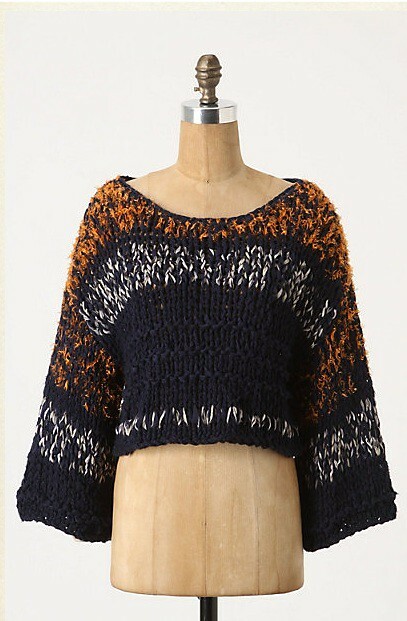 It's a very cute sweater and I think I will wear it quite a bit. Franklin Habit, cartoonist, designer, photographer, author, will present Impractical Magic: The Other Side of Weldon’s Practical Needlework at the Seattle Knitters Guild on September 7 at 7 pm. Beginning in the 1880s, and for decades thereafter, the editors of Weldon's Practical Needlework provided an enormous audience of amateur craftswomen with patterns for garments designed to be warm, strong, long-lived and, well, practical. But Weldon's had another side, too. A side that proposed the knitting of covers for tennis balls, of knitting whips for children, and of covering open flames with crinkled tissue paper. In this illustrated talkânot for the faint of heartâwe'll take a look at what our great-great-grandmothers were up to when they'd already knit a sufficiency of Socks for Invalids. As always Guild meetings are free and open to the public. It's September 1st. Summer is coming to an end. Which means it will only be in season to wear these "swimsuits" for a few more days. Kind of takes the sting out of summer ending, doesn't it?